Get the 40 ad campaigns that helped Apple reach $1 trillion dollars of market capitalization when you subscribe. We broke down 40 famous Apple advertisements and marketing campaigns to help tease out timeless marketing principles. These are the first principles of marketing that helped take Apple from a garage to a $5B spaceship. Well, not exactly a spaceship. But a $5B campus that looks like a Spaceship, and a $1 trillion dollar market capitalization. Not to mention they popularized technology and portable computers around the globe. Not too shabby for two guys in a garage that couldn’t raise any venture capital! 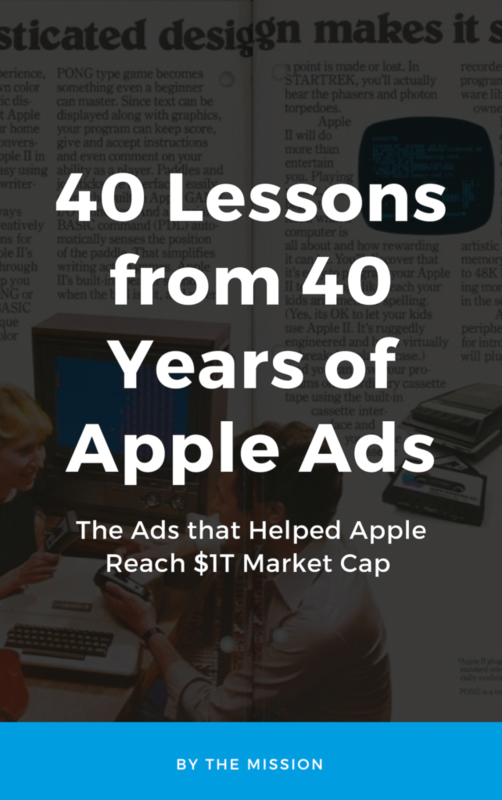 So subscribe today, and get The 40 Ads that Helped Apple Reach $1T Mkt Cap!